This study is a part of a collaboration with DAI-Labor of TU Berlin, Germany. We envision the future of collaborative robots (cobots) in industry through their fully autonomous human-like collaboration with human partners. Our research aims to address the question: "How do we build cobots with human-like natural collaboration skills?". 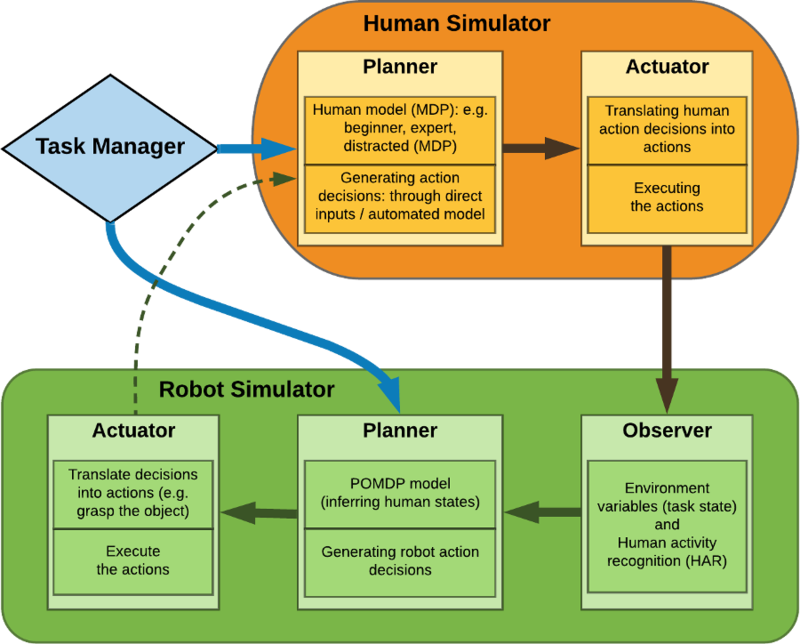 Existing intention-aware planning approaches often make the assumptions that a human collaborator's actions are always relevant to the collaborated task and that the human always accepts the cobot's assistance when offered. We believe that these assumptions are a significant barrier against having social cobots in the real world. In reality, a human's dynamic desires and emotional states could result in stochastic human intentions, especially in repeated tasks. A cobot with these assumptions may misinterpret the human actions, which may result in intrusive and unreasonable robot behaviors (e.g. a human gazing at an object might be interpreted as she needs it, yet behind this gaze, she could be evaluating to take it herself or thinking of something irrelevant to the task like staring into space). When the human's intention is irrelevant to the assigned task and may be unknown to the cobot, e.g. motivation lost, becoming tired, incapable. When the human's intention is relevant to the task, but the human does not want the robot's assistance, e.g. due to the human's task-relevant distrust. To handle these conditions, our POMDP breaks the anticipation of a human's state of mind into stages (see the model figure below). In the first stage, the cobot anticipates the human's task-related availability, intent (motives) and capability (covering the 1st condition above). Then, moving from these first stage estimates, in the 2nd stage the cobot further reasons about whether or not the human really needs assistance with the task (covering the 2nd condition). Treating the 2nd stage as stochastic prevents the cobot from just taking over the human task when it should not, e.g. maybe human wants to try again, or may not trust the robot with the task at all. To validate our model, we focus on a smart factory environment created under MORSE simulation (see the figure below). We consider an HRC scenario at a conveyor belt for the task of inspecting and storing various products. There is a time limit for each product to be processed, or else the conveyor runs resulting in a task failure. Thereby, we simulate a continuous production. We also simulate human behaviors inspired by many social studies. 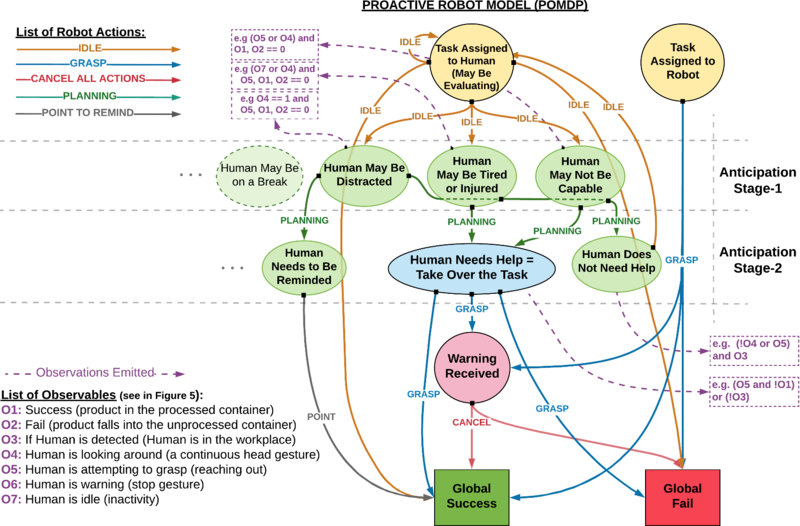 Our human decision models are towards randomly reflecting such unexpected conditions like getting tired, distracted, incapable of fulfilling some tasks, etc. Such models allow us to rigorously test the capability and adaptation skills of our robot model to such short-term changes in human behaviors. For the sake of testing our ideas, we compare our proactive model with a reactive one, which does not anticipate the two conditions above and takes over a human task after following some deterministic rules, e.g. the human did not complete the task in a given time, etc. Our results show that taking these conditions into account yields more efficient and natural collaboration in a realistic HRC setup. Future work will focus on increasing the adaptation skills of the cobots through a policy generation mechanism in response to changing human characteristics and validating our results through user studies. 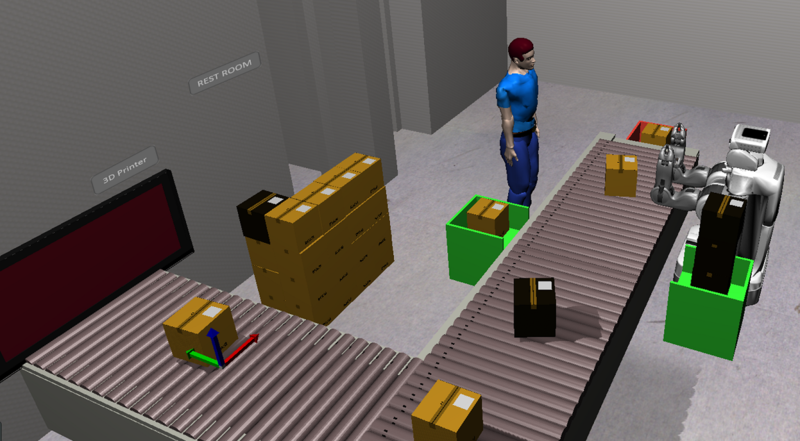 More details on the robot models, the human simulation model, our test environment and large-scale experiment results can be seen here!